Stop by the Education Center to explore city art-themed puzzles, books, toys, and building materials. We’re celebrating the art of mosaics all through May in our Discovery Room! Members have the Museum in Downtown Brooklyn all to themselves during Member Mornings, First Sundays! Explore our vintage cars, enjoy our exhibits, and take your turn in the bus driver’s seat ─ without the weekend crowds! Members will have exclusive access to the Museum from 10 am to 11 am and enjoy free admission year-round. After we look at some mosaic artwork from subway stations, we’ll mix up some plaster and grout and build a large, colorful mosaic together! Ages 2-5 and adult companions. Join us for an evening of drawing at the New York Transit Museum! Hosted by New York City-based illustrators, the evening will begin with an introduction and short discussion. 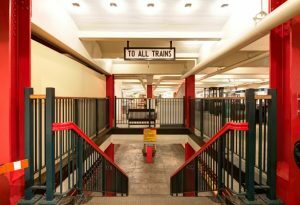 Following the conversation, explore the Museum and draw inspiration from bygone days in our 1936 decommissioned subway station and vintage subway cars.